Meditation is recommended for everyone. Not only does it offer incredible benefits for clarity of mind and overall well-being, it’s also a powerful spiritual tool to help us navigate our lives. But, getting started with a meditation practice can be hard! I often hear people say they can’t meditate, or they tried meditating, but they became too distracted. “I can’t seem to clear my mind,” they might say. Many beginners struggle with this idea that in order to ‘properly’ meditate, one must sit motionless, eyes closed, and clear your mind of all thoughts. Failure to do so means that you have ‘failed’ to meditate. The truth is, meditation is called a practice, because it really does take practice. Actually clearing your mind is not an easy task. I suggest people begin a meditation routine in one of two ways: guided meditation, or nature meditation. If you choose to get started using guided meditation, I recommend finding meditations with a focus on visualization. This gives your mind something to do while you are moving through the meditation. You may still have wayward thoughts come into your mind, and that’s okay. Just stay with your guide and use your imagination to create rich visualizations. This will help keep you from following those unwanted trails of thought. You can download all kinds of guided meditations online. I recommend listening to the sample first to find those that truly resonates with you. 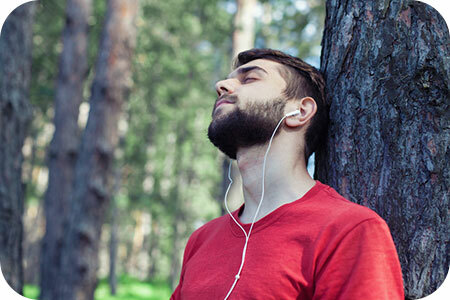 Nature meditations are my favorite and can help you attune with the environment around you. They also require you to take a short walk in nature, which is always good for the soul. If you’re able to do this in the area where you live, head out for a walk in the woods or on the beach Take your time and pay attention to the fauna and flora around you. Listen to the wind through the trees and bring your awareness to the feel of the breeze on your skin. Is it warm or cool? Breathe in and feel it move through your lungs, refreshing you. Allow yourself to be immersed in the environment, and be aware and present in each step you take. As you focus on the environment, and just being with yourself surrounded by the magic of nature, you will find yourself less bothered by nagging thoughts. This may not seem like a meditation at all, but it is a method to get your brain used to being present in the moment. It’s important to make your meditation practice your own. It needs to fit your lifestyle and should be something you can look forward to, instead of feeling like a chore. Finding the right style of meditation is also vital, in order to make this a fun and exciting experience. Remember that meditation doesn’t have to take up a lot of time. When you’re first getting started, trying to meditate for long periods of time can be very discouraging. Start with a few minutes at first and allow your practice to evolve naturally. The next time you feel inspired to meditate, remember that there are many different ways to do so. Ask both your body and your mind what kind of meditation feels right in that moment, and always follow the intuition they provide. Using various methods of meditation will greatly enrich your practice and also keep things fresh and interesting. Meditation is meant to bring your focus into the present moment. As you become more adept at staying in the present, clearing mind will come much more naturally. Seraphim's natural Clairvoyant, Clairaudient, and Empathic abilities to receive messages and connect with Spirit first came to the fore in early childhood. Upon discovering her mom's Tarot deck, not long after her death, Seraphim was led on a journey that helped her to explore her vast gifts. Seraphim continues to receive steady guidance and messages directly from her Spirit Guides and Angels, and has maintained a steady and successful private practice based in Edmonton. She remains very active in her spiritual community, and often is called upon to lead local events. Self-taught, she's mastered Tarot Reading and a powerful technique called "Eye-Gazing" that allows her to convey precise information to the client. She works with "The Sacred Art of Creation", leading empowered women's circles that facilitate self-healing, manifestation and alignment. If you'd like a reading with a compassionate reader who can both hear and convey direct messages from Spirit Guides and Angels, you can find Seraphim at PsychicAccess.com.